Ultra Fun Run is committed to protecting your privacy. We appreciate your trust in us. To get the full benefit of our personalized service, we ask you to give us information at different points on our website. Therefore, we want you to know exactly what information is collected, why we collect it, how we protect it and how you can access it or change it. This policy covers only the information collected on the Ultra Fun Run site. Sites that link to or from our site, and sites hosted by our various partners, are not covered by this policy. We encourage you to read the privacy policies of every site that you visit. For your convenience, this policy is linked to every page where we ask for information on our site. If you have any other concerns after reading this policy, please go to our Help page, where many frequently asked questions about Ultra Fun Run site are answered. If you have any additional questions, please contact customer service by e-mail at info@ultrafunrun.com. This policy refers to all information collected on Ultra Fun Run website. On our site there are pages where we ask you to enter information in order to receive specific services. When you first register with the Ultra Fun Run site, we ask for your name, school code, grade, teacher, e-mail address and a password. Once you supply this information, you will be able to personalize an online pledge store and launch emails to friends and family inviting them to sponsor a Jog-A-Thon participant to support a school or organization. You will also be able to monitor your progress throughout the sale. For people pledging money on a participant’s personalized page, personal information provided will be used only for the fulfillment of the pledge. 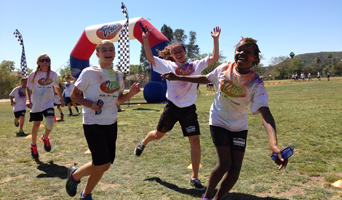 All information sent via e-mail will come directly from Ultra Fun Run or the school / organization you are supporting. We will not sell or rent this information to anyone else. All information on current and former members is retained in our database for customer service and state and federal compliance purposes. Ultra Fun Run does not share your personally identifiable information with third parties for promotional or other purposes unrelated to products you order. If you submit a pledge, your name, postal address and e-mail address and credit card information is shared only with Authorize.net to process your pledge order and to provide you with better customer service. Credit/debit card information is never shared with outside parties for promotional or other purposes unrelated to products you order. As explained above, when you submit a pledge online, we will ask for your name, mailing address, your phone number and credit/debit card information. This information will be used only to process your pledge order. We will not share credit/debit card information with anyone. As an extra precaution, Ultra Fun Run uses the latest SSL encryption technology for a secure online ordering environment. We believe that protecting the privacy of children is crucial. Therefore, we always ask for contact information for parents or guardians to inform them on any and all child online registration. Any images of children are protected by the latest SSL encryption technology and are visible only to friends and family whose email addresses you provide. Ultra Fun Run uses the latest SSL encryption technology for a secure online ordering environment. We also take every precaution available to protect the loss, misuse or alteration of the information under our control. This includes physical, electronic and managerial procedures to safeguard all the information stored on our servers. This policy is implemented company-wide, and we make sure all Ultra Fun Run employees understand the policy and inform them any time there is a change in the policy. Also like most other websites, the Ultra Fun Run website uses IP addresses to analyze trends, administer the site, track users' movements inside the site, and gather very general demographic information, in the interest of better serving our members and streamlining our operations. IP addresses are not linked to personally identifiable information. ]We may use third party service providers to help us run the activities on this site, for example, to deploy emails or process credit card payments. Those third party providers are not authorized to use the information they obtain for any purpose other than to fulfill the function which we have asked them to provide. Ultra Fun Run wants to keep you well informed and happy. If you ever have any questions or comments, please contact customer service.